This is a screen to create a document. 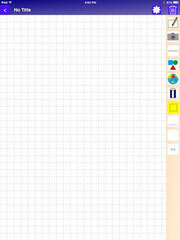 You can input sentence and add photos, lines, diagrams and map. 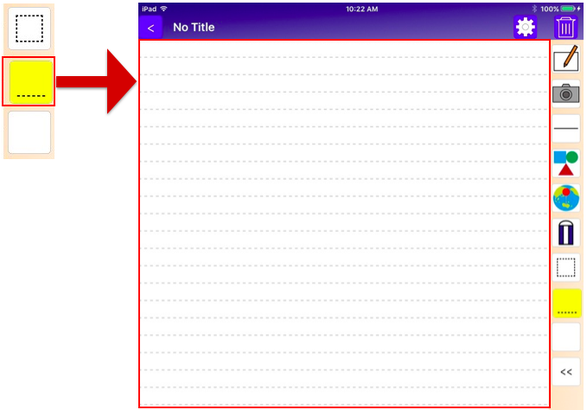 You can choose document type from grid or rule or plain. 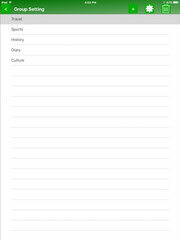 This is a screen to input document’s title and date, and set up groups for a document. You can see documents in each group on List Screen by setting groups. This is a screen to create, change or delete a group. This is a screen to display documents in each group or date. Title Bar: It displays document’s title. Tool Bar: Tool bar has buttons inputting sentences and adding photos, lines, diagrams and map.And it also has buttons selecting document types(grid, rules or plains). 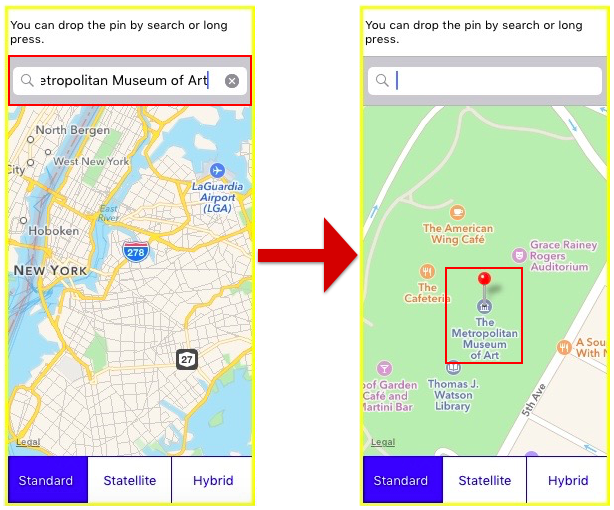 Operation Buttons:Operation buttons are displayed when you select sentences, photos, lines, diagrams and map.It provides the function for scaling up, scaling down, moving to the front, moving to the back, setting of color(only line and diagram), viewing the location on map and change the scale of the map. Tap “the plus button” on List Screen. Tap document’s name on List Screen. Tap "Handwritting Input" button on Tool Bar. A.Tap this button when you choice a regular pen. B.Tap this button when you choice a thick pen. C.Tap this button when you erase a part of the content. D.Tap this button when you erase all the content. E.Tap this button when you up the size of pen. F.Tap this button when you down the size of pen. G.Tap this button when you change the color of pen. Tap “abc” button on Tool Bar. Tap place to input the sentence. A frame is displayed and input sentence. Tap "Color" button when you want to change sentence's color. If you move sentence block, do the following. (2).Drag sentence block after seeing that the frame of sentence block is displayed. If you change width and height of sentence block, do the following. (1).Tap sentence block. Frame and operation buttons are displayed. (2).Tap “the width up button” and width of sentence block become increasing. 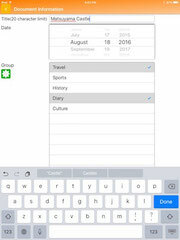 (3).Tap “the width down button” and width of sentence block become decreasing. (4).Tap “the height up button” and height of sentence block become increasing. (5).Tap “the height down button” and height of sentence block become decreasing. If sentence block piles up other sentence blocks, lines, diagrams, and map, do the following and you can move sentence block to the front or back. 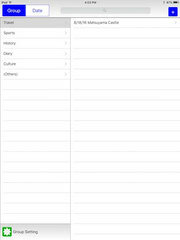 (2).Tap “to front button” and sentence block moves to the front. (3).Tap “to back button” and sentence block moves to the back. Tap “the photo button” on Tool Bar. Tap place to add a photo. Display the screen for selecting from photos. If you move a photo, do the following. 2.Drag a photo after seeing that the frame of photo is displayed. If you change width and height of a photo, do the following. (1).Tap a photo. Frame and operation buttons are displayed. (2).Tap “the scale up button”, and width and height of a photo become increasing. (3).Tap “the scale down button”, and width and height of a photo become decreasing. Also, when you pinch on a photo, and width and height of a photo changes. The max limit of height and width of a photo is 700px, and the min limit of height and width of a photo is 100px. If a photo piles up other photos, sentence blocks, lines, diagrams, and map, do the following and you can move a photo to the front or back. (2).Tap “to front button” and a photo moves to the front. (3).Tap “to back button” and a photo moves to the back. Tap “the line button” on Tool Bar. Tap starting position of line. Tap ending position of line. If you change line’s color, do the following. (2).Frame and operation buttons are displayed. (3).Tap “the fill color button”, and the select color screen is displayed. If you change length of line, do the following. (3).Tap “the extending line button”, and length of line extends. (4).Tap “the shortening line button”, and length of line shortens. Also, when you pinch line, and length of line changes. If you change the distal end of line into the arrow, do the following. (3).Tap “the arrow point button”, the distal end of line changes arrow. 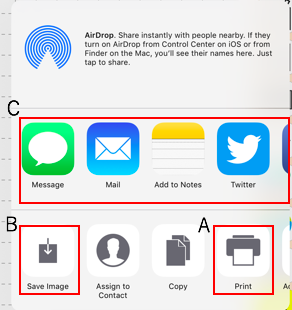 (4).Tap “the double arrow point button”, both the distal start of line and the distal end of line change arrow. (5).If you change the distal end of line and the distal start of line into normal, tap “the normal point button”. If you move a line, do the following. 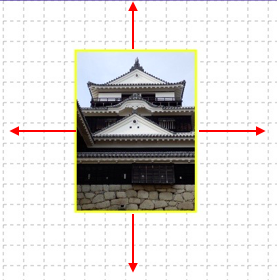 (2).Drag a line after seeing that the frame of photo is displayed. If a line piles up other lines, sentence blocks, photos, diagrams, and map, do the following and you can move a line to the front or back. (1).Tap a line. Frame and operation buttons are displayed. (2).Tap “to front button” and a line moves to the front. (3).Tap “to back button” and a line moves to the back. Tap “the diagram button” on Tool Bar. Tap place to add a diagram. 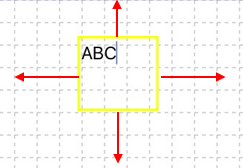 Select type of diagram(rectangle, triangle or circle). 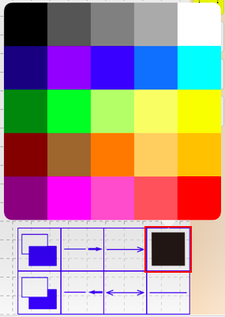 If you change diagram’s color, do the following. 2.Frame and operation buttons are displayed. 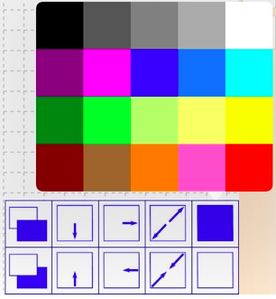 3.Tap “the fill color button”, and the select color screen is displayed. If you clear diagram, do the following. (3).Tap “the clear color button”. 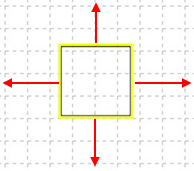 If you change width and height of a diagram, do the following. (3).Tap “the width up button”, and width of a diagram become increasing. (4).Tap “the width down button”, and width of a diagram become decreasing. (5).Tap “the height up button”, and height of a diagram become increasing. (6).Tap “the height down button”, and height of a diagram become decreasing. (7).Tap “the scale up button”, and width and height of a diagram become increasing. (8).Tap “the scale down button”, and width and height of a diagram become decreasing. Also, when you pinch on a diagram, and width and height of a diagram changes. If you move a diagram, do the following. 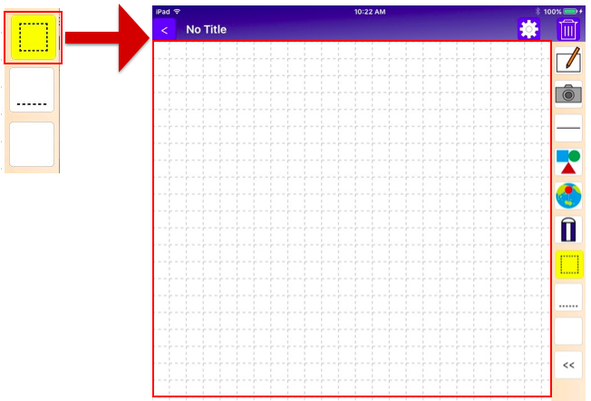 2.Drag a diagram after seeing that the frame of photo is displayed. If a diagram piles up other diagrams, sentence blocks, photos, lines, and map, do the following and you can move a diagram to the front or back. 1.Tap a diagram. Frame and operation buttons are displayed. 2.Tap “to front button” and a diagram moves to the front. (3).Tap “to back button” and a diagram moves to the back. Tap “map button” on Tool Bar. Tap place to add a map. If you change the scale of a map, do the following. (1).Tap map, and frame and operation buttons are displayed. (2).Tap “plus button” and the scale of a map is scaled up. (3).Tap “minus button” and the scale of a map is scaled down. Also, when you pinch on a map, and the scale of a map changes. If you change the display position of map, drag on a map. If you display the current place on a map, do the following. 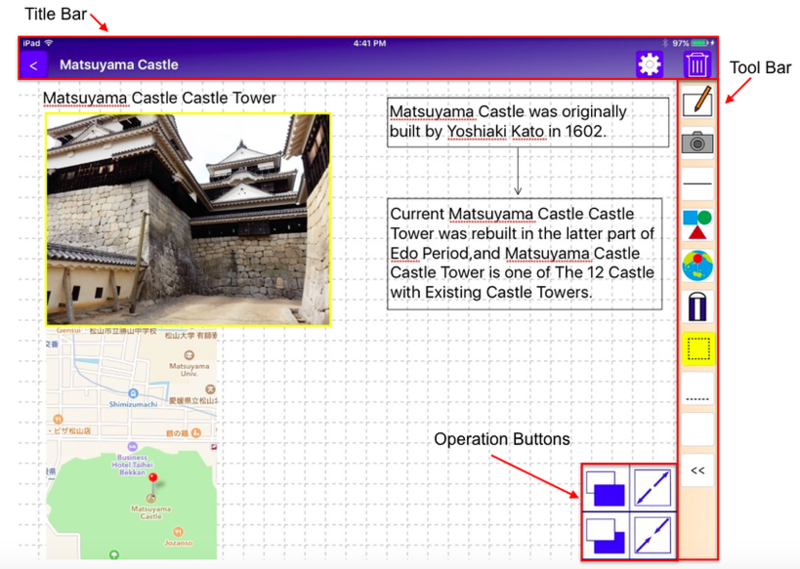 (1).Tap a map, and frame and operation buttons are displayed. (2).Tap “the current place button”, and a map around current place is displayed. If you erect a pin on a map, do either following ways. A.Tap a map, and search bar is displayed. Input adderss or name in search bar and tap Search key. B.Doing a long press of the place which you want to erect a pin. (2).Tap “the delete pin button”, and a pin is deleted. If you change width and height of a map, do the following. 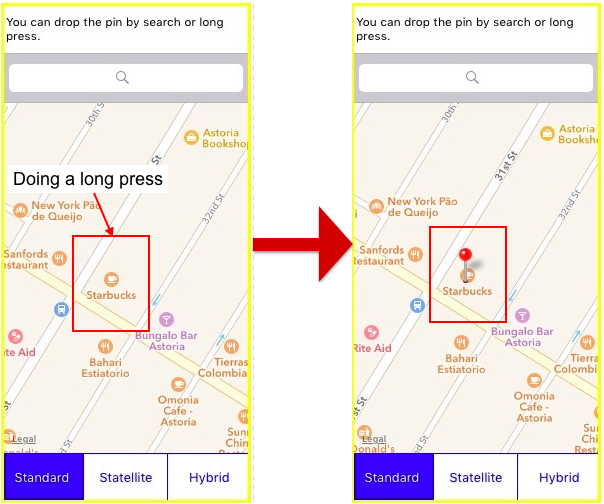 (2).Tap “the width up button”, and width of a map become increasing. (3).Tap “the width down button”, and width of a map become decreasing. (4).Tap “the height up button”, and height of a map become increasing. (5).Tap “the height down button”, and height of a map become decreasing. (6).Tap “the scale up button”, and width and height of a map become increasing. 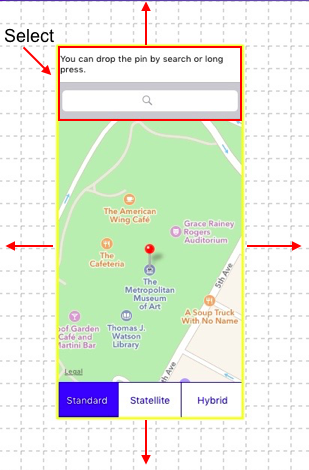 (7).Tap “the scale down button”, and width and height of a map become decreasing. The max limit of height and width of a map is 700px, and the min limit of height and width of a map is 200px. You cannot change the height and the width of a map by pinching. If you pinch on a map, and the scale of map is changed. If you move a map, do the following. (2).Select search bar and drag a map after seeing that the frame of map is displayed. If a map piles up other maps, sentence blocks, photos, lines, and diagrams, do the following and you can move a map to the front or back. (1).Tap a map. Frame and operation buttons are displayed. (2).Tap “to front button” and a map moves to the front. 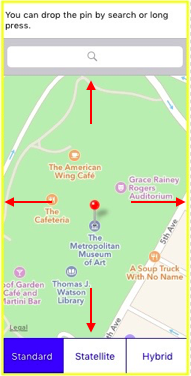 (3).Tap “to back button” and a map moves to the back. Tap “Eraser button” on Tool Bar. Tap sentence, photo, line, diagram, or map. Tap “grid button”, and document type changes grid lines. 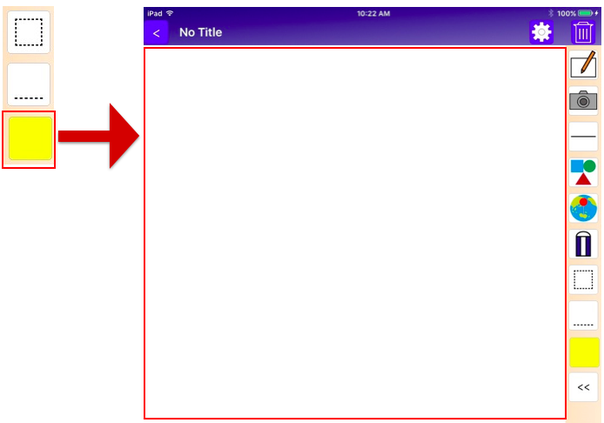 Tap “horizontal ruled line button”, and document type changes horizontal ruled line. Tap “plain button”, and document type changes plain. Setting of document type is saved per document. 13.Set document’s title and date and groups. Tap “edit button” on Title Bar. Document Information Screen is displayed. Input document’s title. The max limited of document’s title is 20 characters. Tap and select document’s groups. You can select plural groups. 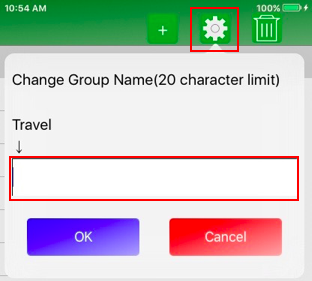 If you change groups, tap “group edit button”, and Group Setting Screen is displayed. A.If you add a group, tap “plus button”.Input new group name. B.If you change group’s name, select group and tap “edit button”.Input new group name. 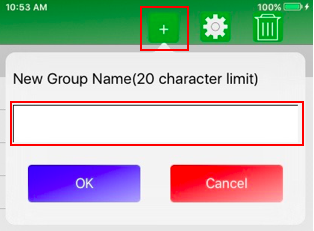 C.If you delete a group, select group and tap “trash button”. A.Tap "Print" and note is printed. B.Tap "Save and Image" and note is saved as an image. C.Tap these applications and note is uploaded as an image or a PDF file. A. Note is printed or Note is saved as a PDF file. B. Send gmail with an image as attachment. 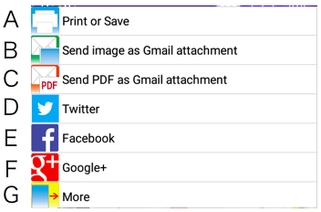 C. Send gmail with a PDF File as attachment. D. Note is contributed to Twitter as an image. E. Note is contributed to Facebook as an image. F. Note is contributed to Google+ as an image. G. Note is uploaded to other applications on Android. Tap “trash button” on Title Bar of a document which you want to delete.